So, if you haven’t been following along, Matt Murdock is Mayor of NYC after the hand fired dozens of arrows in Fisk leaving him for dead.... oh yeah and Wilson Fisk was Mayor before that... ANYWAY... we open with Matt asking Foggy to be his new Chief of Staff so he can help cover for his “sudden” disappearing acts to help the city fight the Hand. 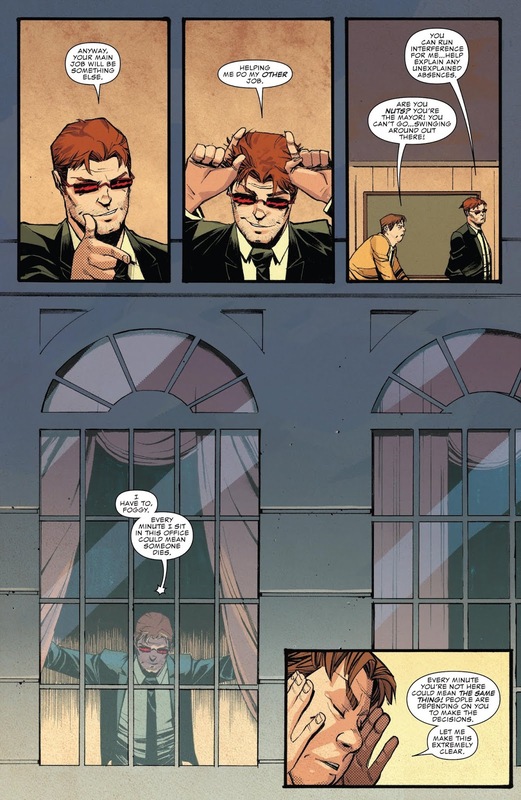 Blindspot, Daredevil’s young protege, breaks through the window and explains why he feels the Hand his here. Blindspot made a deal with the Beast that runs the Hand. The deal was Power to beat the Muse (a psychotic serial killer/ experienced fighter...they’re kind of rivals... Muse kind of ripped out Blindspots eyes at one point... it was this whole thing...) in exchange for servitude and basically his soul. However, he never used the power and didn’t need it to beat the Muse. So, he thinks the Hand is here in NYC to take its vengeance out on him. So, Daredevil hears that 2 blocks away from the police station is under attack. So, he leaves to help with Blindspot. They take out dozens of Hand Ninjas only to find the police station empty and destroyed inside. There is a huge hole straight through the station leading underground. Something big must have done it. But what? My thoughts: honestly, it wasn’t bad but it was a bit boring. Personally, I don’t like wordy dissertation... I mean comics (this coming from the guy who writes long reviews... I see the irony). And this issue wasn’t wordy at all. I think that’s what helped in my “liking” of the issue. It may have been a bit boring and the story may not have progressed too much, but it was a quick read and not wordy at all. That really helped to even out the issue for me. The only thing worse than boring is wordy and boring. This was far from that. Give me something wordy, boring, and convoluted, and I’m out! This is straightforward and easy to follow. I love that about Soule in general. He explains his issues so well. Now, I make this issue sound bad. It wasn’t bad it just wasn’t as good as the last issues. 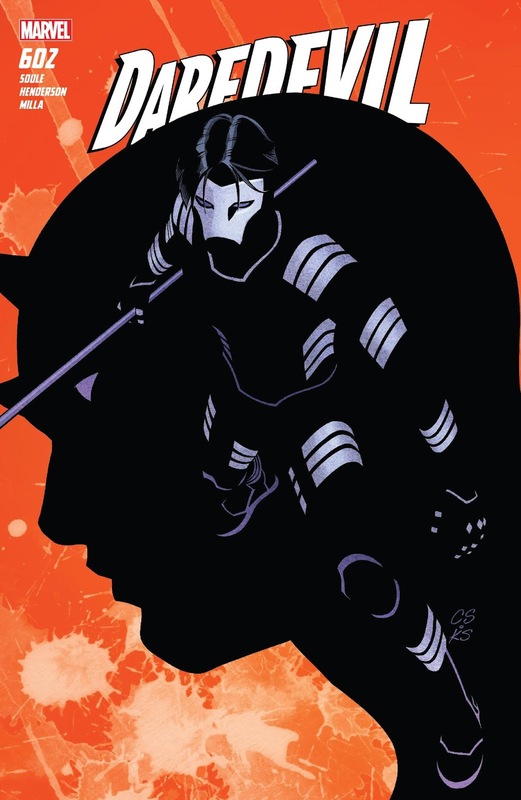 The past four issues have been filled with excitement and nonstop action. This issue just took the foot off the pedal for an issue. In trade, you probably won’t notice. For a single issue, it stands out. My bigger issue is, was this issue needed? 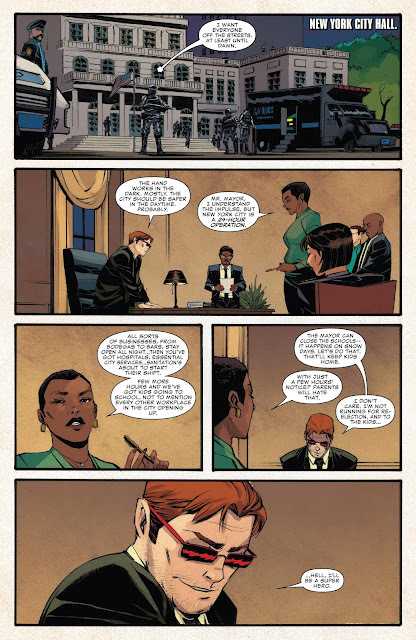 Ultimately, we get Daredevil out of his Mayoral Office and into a hole at the police station. Couldn’t we have done that in a couple pages and given us more in the issue? Soule still gets Daredevil. He is doing so well with the character and I hope this duo sticks around with him for a long time. ( I don’t like to read solicitations so I don’t know) It really is a great partnership. Could you skip this issue and still be right in the thick of the overall story? In my opinion, yes. And that’s the only reason why my score is a bit lower than normal. But that said, it’s still in my pull. No doubt! But, it has slid down my stack a bit. I’d say right above half way.